German Shepherd’s are used as military dogs due to their high intelligence. 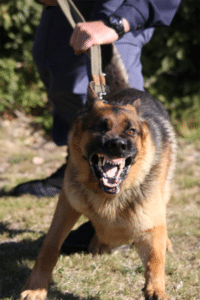 German Shepherd attacks are one of the most commonly reported dog attacks in the United States. If you have been attacked by a German Shepherd through no fault of your own, you may have legal recourse. When raised by a negligent dog owner, German Shepherds can be very vicious. Call us for a free consultation about your rights: 1-800-298-0111. German Shepherds originated in Germany where they were dubbed the “Deutscher Schäferhund“ or German Shepherd. German Shepherds are highly intelligent and trainable dogs. For this reason, they are often used as sheep herders, drug dogs, bomb sniffers, military dogs, seeing eye dogs, rescue dogs, and guard dogs. They also make faithful companions when raised well. However, when trained to be vicious or improperly raised, they can be very vicious attack dogs. German Shepherds are often used as guard dogs for businesses, junk yards, car lots and warehouses. The problem with having dogs that are trained to defend property against strangers is that the owner has to be care not to let these dogs come into contact with other “strangers” that he does not intend for them to attack. If there is a gate left open or a hole in the fence, these dogs may get out and attack people that are not really a threat to the property the dog believes it is protecting. Furthermore, if the property entrances are not properly secured and/or marked with warnings, unsuspecting meter readers, postal workers, salesmen and other visitors may become victims of German Shepherd attacks by mistake. If you have been attacked by a dog, call Simmons and Fletcher, P.C. for a free consultation. At Simmons and Fletcher, P.C., our dog bite attorneys will investigate your case with no charge to you. If we take on your case, we do not charge any attorneys fees unless we make a recovery in your case. Call us today: 1-800-298-0111. What Recourse Do I Have If Another Dog Attacks Another Dog?